One of the nice things about the Bureau of Labor Statistics site is the centralized location of employment and labor trends data which inspires interesting articles. Count today as one of those days; the BLS today released figures on the rates of volunteerism in the United States. 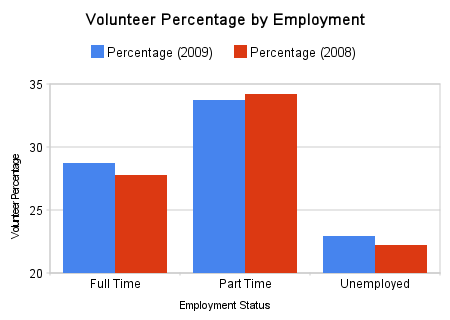 In the midst of a recession, volunteer rates increased in the United States from September 2008 to September 2009. In fact, the percentage rate of volunteering by citizens in the United States is now .1% higher than it was in September 2006, after a falloff from that point in 2007. To starts off this examination, note that women out-volunteer men. 30.1% of women, or 36,706,000 people, volunteered between September 2008 and 2009. Comparatively, 23.3% of men, or 26,655,000 people, volunteered between the same dates. 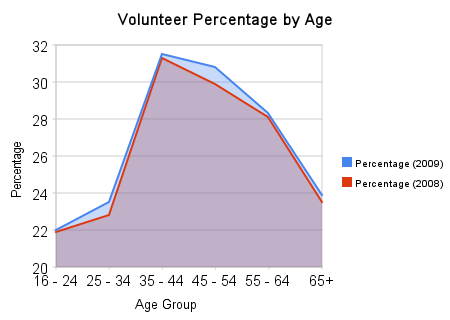 The numbers are more interesting by their breakdown, however, so I present this chart of volunteering by age group. 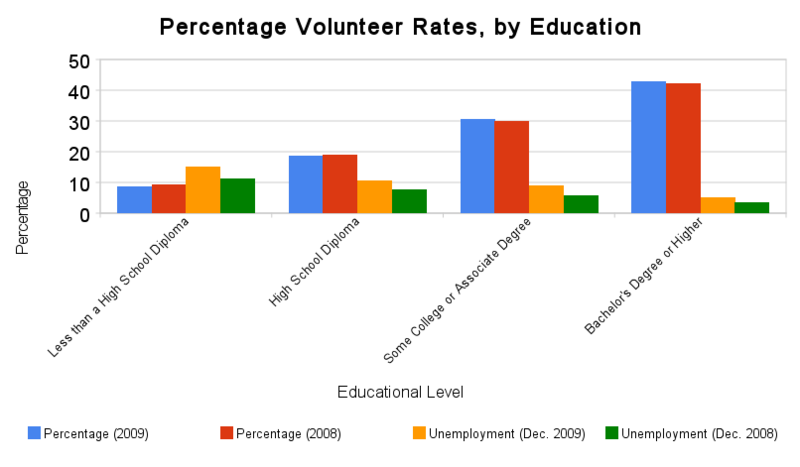 So while volunteer rates have fallen among those with a high school diploma or less, they have been more than supplanted by those with at least some college. This leads to a final question, how does employment status affect the numbers? Unemployment has increased across all four educational measurements, but volunteer percentage hasn’t increased proportionally. What to make of the data? Encouraging, at first glance. There are more interesting charts in the report, letting us know, for example, that married couples volunteer more, and those with children volunteer more than those who don’t. All of this data comes from the first table; there are 5 more tables for you to glance through. The salient point? Americans volunteer, even through the rough times. Do you volunteer? How does it fit into your financial planning? I’m interested in your comments! I think there is a correlation between married couples (especially those with children) volunteering because they tend to have more opportunities for volunteering. Almost all childrens’ activities rely on volunteers for support. There may also be a correlation between education and volunteerism which could be due to economics or the number of hours worked. That would be a little more difficult to prove, but it would be an interesting study. .-= Patrick´s last blog ..H&R Block At Home (formerly TaxCut) 2009 Tax Season =-. Let me dig further into the tables and see what we can find… that’s an interesting point. I also seem to recall more volunteer opportunities in college (which would seem to suggest that ‘some college’ should be higher). Furthermore, through work I am also introduced to other opportunities to volunteer. I’ll see what I can find and give you another post this week! Actually, I am wrong. The educational attainment only applies to those 25 years old and older.